We are radiologists who provide diagnostic MRI consultation to veterinarians, and that's all we do. With world-class training, specialized focus, and decades of experience, we offer exceptional diagnostic accuracy and prompt service to give you the answers you need. Please visit our MRI Vets Community page to access articles about MRI sequences, positioning, and our MRiPedia archive of past cases. Patrick R. Gavin, DVM, PhD, DACVR/RO, is Professor Emeritus in Veterinary Radiology, Washington State University. Dr. Gavin is the founder of MRI Vets, and has over 30 years of experience with MRI as a diagnostic modality for animals. Since the inception of MRI Vets in 2002, he has reviewed over 100,000 cases and continues to review more than 200 per month, while maintaining an archive of thousands of cases for review. Dr. Gavin is the author of several veterinary texts, including Practical Small Animal MRI, published by Wiley Press. He resides in Sandpoint, Idaho. 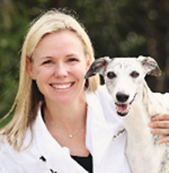 Jaime E. Sage, DVM, MS, DACVR received her veterinary training at Texas A&M, and completed her residency at Ohio State. Formerly with IDEXX laboratories from 2005 to 2014, she has specialized in MRI. Dr. Sage has over 15 years experience reading MRI and has performed more than one hundred onsite MRIs since 2011 in partnership with an MD radiology group. This hands-on experience gives her an appreciation for the challenges clinicians face in developing protocols, maintaining anesthesia, and working with animal owners who want answers fast. Dr. Sage resides in Austin, Texas. While most teleradiologists generalize in all diagnostic modalities, we specialize in MRI. This unique focus means we read more MRI studies than almost anybody, giving us the kind of diagnostic confidence that comes only from experience. We take client service seriously too, and as a small team we take pride in being highly responsive to our referring veterinarians. We hope you will give us a chance to work with you! Do you have more questions? Please see Our Services page for pricing, turnaround times, and more. To send us a case, please visit our contact page. Also, please visit our ﻿﻿FAQ for Veterinarians﻿﻿ or our FAQ for Animal Owners. We also offer MRI fellowship training.